Brazil's Congress Voted To Impeach President Dilma Rousseff, So Now What? 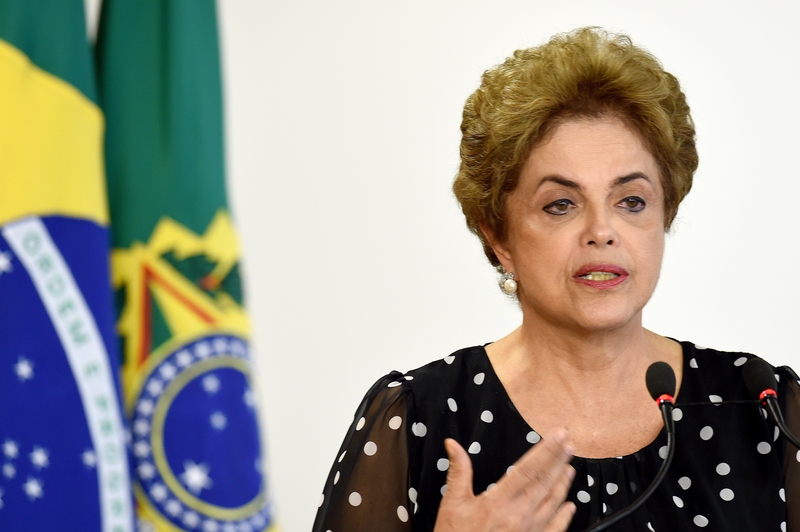 The most powerful female leader in the Americas may be ousted from office in the near future. On Sunday, Brazil's lower house of Congress voted to impeach Brazilian President Dilma Rousseff, who has two years left in office, amid a corruption scandal about the country's budget. Now, the Senate will vote on whether or not to hold a trial over charges that President Rousseff used money from state-run banks to cushion the country's budget in order to help her get reelected (which she denies). The next vote is expected to happen in May, and if a majority of the 81-member Senate votes against Rousseff, she will temporarily abdicate her position for 180 days while the trial plays out. Because the Chamber of Deputies' vote was 367 to 137 (with seven abstaining and two not voting), some political analysts believe the Senate will impeach the president with a two-thirds majority. Vice President Michel Temer would replace Rousseff throughout the trial, and permanently take over if she is kicked out of office. Some worry that impeaching her could weaken Brazil's fairly democracy, though, as it would signify a major problem in a government that's only three decades old. Julio Marcelo de Oliveira, a prosecutor at Brazil's Federal Accounts Court (known as the TCU) claims that Rousseff delayed repayments to Brazilian lenders who advanced money to pay for social programs, which is against Brazil's fiscal responsibility law. The delay, known as backpedaling, would have made it look like the country's spending was lower than it really was and that it had more money, which could have helped the president get reelected. President Rousseff's reputation worsened when she appointed former President Luiz Inácio Lula da Silva (known as Lula) as her chief of staff amid questions about his ties to an oil company scandal that investigators claim involved almost $3 billion in bribes. Lula's lawyer released a statement that said, “This is an attempt to muzzle a political leader.” Because 700 senior officials in Brazil's government can only be tried in the nation's highest court, Lula's new position made him practically untouchable. Brazil's leadership as a whole is alleged to be corrupt, including many of those who voted to impeach President Rousseff. Vice President Temer allegedly participated in an illegal ethanol purchasing scandal (he denies these allegations). There's speculation that he's too eager to take over, sparked by a message he sent to several Brazilian lawmakers saying, "Without this national unity, it will be difficult to get this country out of the crisis we find ourselves in," as if President Rousseff had already been impeached. The impeachment proceedings come just months before Rio de Janeiro will host the summer Olympics, becoming the center of the world's attention. Temer could be running the country by then, but whoever's in charge will have a lot of obstacles to overcome.